It has been cold here in Brooklyn recently. Not just normal-winter-in-the-Northeast cold, but biting, wind-swept, I-don’t-want-to-go-outside cold. Visiting friends recently felt compelled to invest in heavy duty goose down parkas, and the sidewalks near my Midtown East office are starting to resemble a zoo of small, furry, brown animals (that is, made into jackets, gloves, and absurd hats and worn by women who lunch). E and I were hosting some friends for dinner, and we both agreed that a hearty, warm meal was the way to go. Rick’s brisket, Roasted Squash with Lemon-Tahini Dressing, and Pomegranate Hazelnut Wild Rice fit the bill. Every year, we exchange endless emails about who will host, what the menu will be, and who is bringing what. Then, we travel from all over the country to convene for a day of eating, catching up, and opening presents for the little ones. There is always too much good food to choose from, but we all look forward to Rick’s brisket. One year, the brisket was accidentally left in NYC; sure enough, another NYC cousin who hadn’t yet left the city rescued the brisket and safely delivered it to the party. Finally, a plug for the squash that I paired with the brisket. I read this recipe and was attracted to the combination of sweet squash, spicy red pepper, and sour lemon-tahini sauce. It didn’t disappoint, and I’ll certainly be making it again soon. A big thank you to Rick for sharing his special recipe. As with most family recipes, the measurements are rough. Feel free to play around with them as you see fit. I normally make this in my big dutch oven, but I’m sure it would also work in the oven or in a slow cooker too. 1. Salt and pepper the brisket. Sear on all sides and remove from pot. 2. Saute onions and garlic until soft. Return the meat to the pot and add tomato soup, ketchup, bay leaves, broth, and wine. 3. Bring to a boil, simmer, and cover. Let cook for about 2 – 2 1/2 hours, turning the meat every 30 min or so. 4. Cook the meat long enough but not too long – tender but not falling apart hopelessly (or else it will be difficult to slice). When done, remove the meat from the pot (leave everything else in there), cover the meat, and refrigerate. 5. Add the carrots to the pot and bring to a boil. Cook uncovered for 30+ minutes until the carrots are soft and the sauce is reduced. Season to taste. 6. Before serving, thinly slice the cold brisket against the grain. Return the meat to the pot with the sauce and carrots and reheat on the stove top or in the oven. 2. Cut, de-seed, and slice squash. Place on a baking sheet (make sure squash is not overlapping). 3. Drizzle olive oil and sprinkle 2 teaspoons cumin seeds over squash. Season squash with salt and pepper. Roast for 15 minutes. 4. In a separate bowl, toss scallions, 1 teaspoon cumin seeds, salt, pepper, and 1 tablespoon oil. 5. Remove squash from the oven. Scatter scallions over squash, and roast about 15 minutes longer until squash is tender but not mushy. Squash should be brown and caramelized on the edges. 6. For the sauce, whisk lemon juice, tahini, and water in a small bowl to blend. Gradually whisk in olive oil and season with salt and pepper. 7. 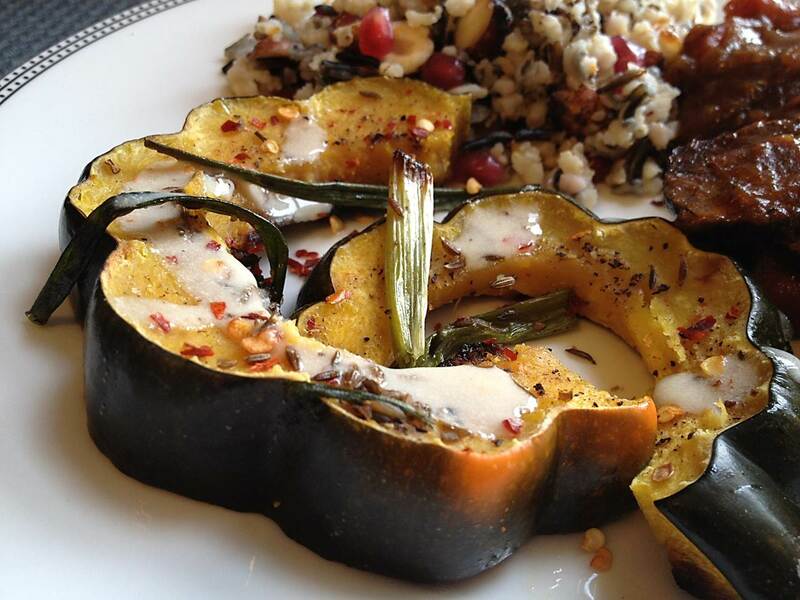 Arrange squash on a platter, drizzle with lemon-tahini sauce, and generously sprinkle with crushed red pepper. I don’t enjoy brisket, but those sides caught my eye – they look delicious! I’m going to try the squash with tahini sauce this week! Great! Looking forward to hearing how it comes out. This is SO good!! I forgot to pick up scallions, so I minced red onion (all I had) and tossed it in the oil and seasonings that are added halfway through. The flavour combination of squash/cumin/tahini/lemon/crushed red pepper is awesome!